It’s official, lavishing yourself with luxurious at-home spa treatments is the new going out (well, that’s what I tell myself every Friday night, anyway). With everyday life going at lightning speed it seems like moments of true relaxation are few and far between, so when you do get a bit of time to yourself, well, it makes sense that it should be a bit special. 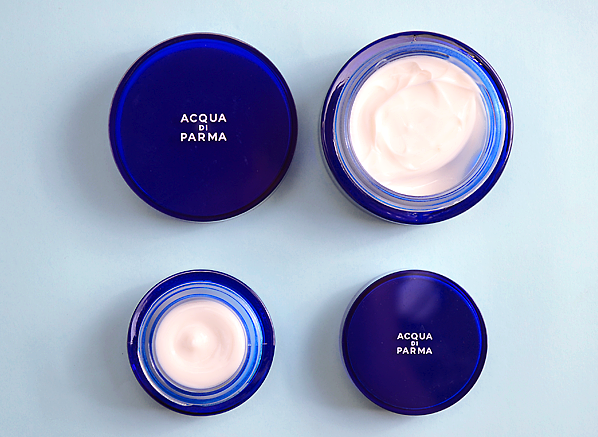 With this in mind, take a moment to appreciate the azure luxury of the Acqua di Parma Italian Resort skincare collection above. Newly relaunched, this collection of pampering products for both the face and body is everything that I love about spa skincare. Its packaging is sleek, its textures are suitably sumptuous, and its scent is so wonderfully invigorating. What makes Italian Resort truly special, though, is its innovative formula – namely its age-defying star ingredient, the Mediterranean Re-Activating Complex. 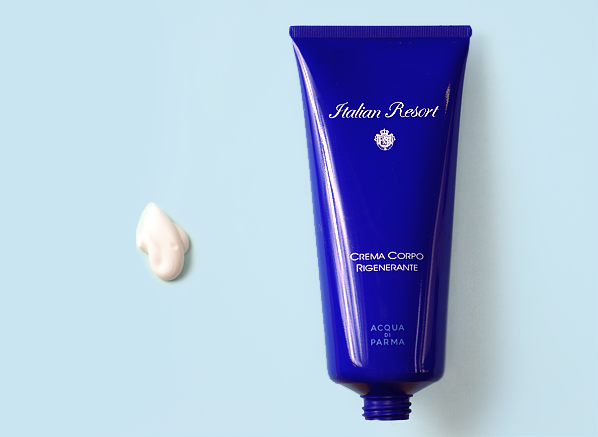 The result of 15 years of research, this potent natural elixir is extracted from Sicilian maritime pine, renowned for its ability to regenerate itself and repair damage. What this means for you and me is a big boost of energy for skin, with improved smoothness, firmness and radiance (almost like spending a week or two in the Med, some might say). Are you ready for the ultimate pamper session? 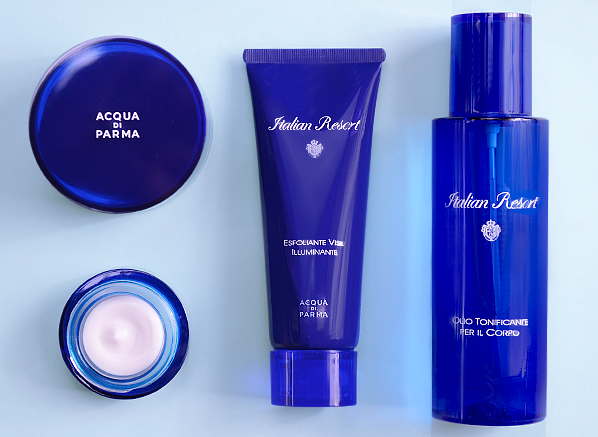 For the body, Acqua di Parma presents a three step ritual for toned and invigorated skin. The first step is my favourite, as the results have been so dramatic (especially following my lax winter skincare routine). The Smoothing Body Scrub sloughs away dead skin cells, improves circulation and retexturises skin with a powerful blend of volcanic pumice for heavy duty exfoliation, jojoba grains to buff and nourish, and citrus zest to brighten and provide mild biological exfoliation. Its creamy, luxurious texture belies just how good it is at nitty gritty exfoliation, and skin is left looking immaculately smooth after use. No spa routine is complete without a dry oil, and this spray-on Toning Body Oil is up there with one of the best I’ve used. It’s extremely nourishing and yet feels light as air on the skin – plus there’s a very specific limb-by-limb application method that you employ with this one that I’ve really enjoyed, which promotes lymph drainage and transforms application from a routine to a proper ritual. The final step is the epitome of sumptuous texture. The ultra plush Revitalizing Body Cream is rich and pampering, which is just what your skin needs to maintain a plumped and smooth appearance. Massage in circular motions to get your circulation going, and enjoy the distinctively fresh and green aroma. 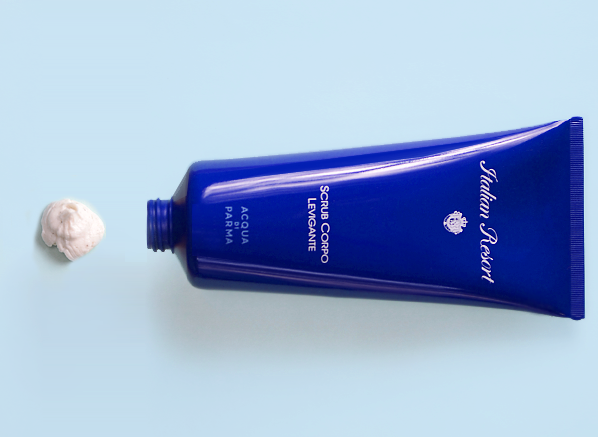 For the face, it’s all about the radiance – and like the body collection it starts with great exfoliation. The Illuminating Face Exfoliant has a gel-creme texture infused with fine pumice grains, which gently buff away dead skin cells to reveal softer, smoother and more luminous skin. It’s lovely to use and feels very much like microexfoliation, which gives such a refined result. Makeup applies like a dream after a session with this. 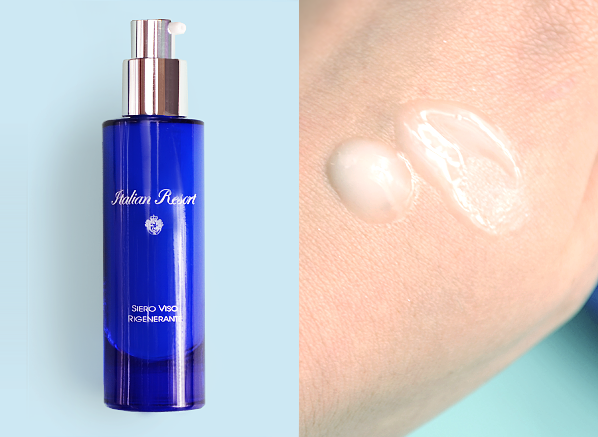 Next in your Italian Resort skincare routine is the product with the most potent dose of the reparative, age-defying Mediterranean Re-Activating Complex: the Revitalizing Face Serum. The texture of the serum is loose and has a lot of slip, so a very small amount goes a very long way. The loose texture also makes it feel really cooling and refreshing upon application – use after cleansing and before moisturising for serious radiance. 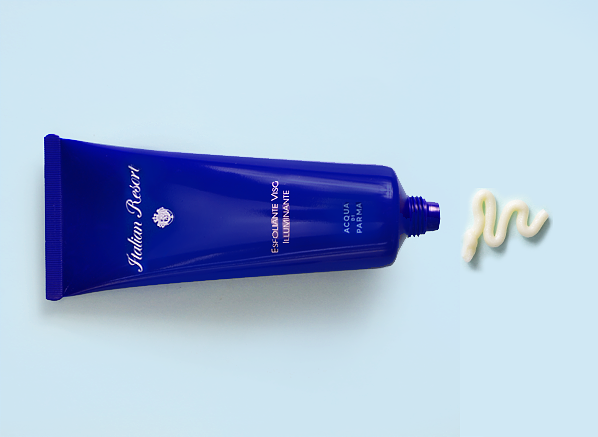 And finally, a duo of creams that envelop skin in absolute comfort. For eyes, the Revitalizing Eye Cream, a bouncy cream that works to minimise dark circles and smooth fine lines, ensuring eyes look brighter and more energised. For the face, the Revitalizing Face Cream, an all-encompassing, age-defying daily moisturiser that is so lusciously creamy that every application feels like a mini facial massage. Consider me well and truly pampered. This entry was posted on Tuesday, April 28th, 2015 at 9:38 pm and is filed under Bath & Shower, Skincare, Tried & Tested. You can follow any responses to this entry through the RSS 2.0 feed. You can skip to the end and leave a response. Pinging is currently not allowed.